Woohoo, off work so I can lurk in this thread. The good thing is I have most, almost all of Hanna's background done, as well as her appearance. Now I just have to finish her gear and wor on her skills and such. Are we factoring luck into our skills thingy, or is that more of a dice rolling thing that we don't need? Scarlett, Thanks to Josi for editing! Anyway have some idea's, or want to work out some links. Feel free to PM me, as things get lost in the OOC specially when you know....sleep. LOL Ok yes sleep for me and I will again work on finishing my sheets tomorrow. Woohoo, I'll be looking forward to that. Would a laser sight on a crossbow add +1 to the user's Archery rating? Barring any objections from Lunar, I'm going to say yes, since the laser would effectively be performing the same function on a crossbow as it would on a firearm. I suppose a laser sight could be calibrated to take into account slower moving projectiles like bolts. Just an FYI in general though... x8 is the best possible skill and ability combination one can attain, whether that comes with the help of laser sights or smartlinks or not. In other words, someone with Agile x4 and Firearms x4 would get no added benefit from any sort of firearms enhancement. At that point you're so good that things like laser sights and smartlinks do nothing for you. Also, one can assume in the RP that your Agile plus any cover you may have can protect you from incoming projectiles like bullets. Just work with each other or the GMs in that case and a 'victor' can be worked out by comparing stats and the scene as written. Just like Agile and Unarmed or Melee work as a 'to hit', they can also work defensively, assuming they are defending against a non ranged attack. SIMPLE TERMS: Agile levels are always used to attack and defend, along with appropriate skills. Use the 'stats' to aid in the RP, but in general don't let them get in the way of doing cool stuff against NPCs. Corvus and Kuro have been invaluable in helping me, and at this rate I anticipate having a char bio for approval by Saturday! I'm off to work for the night. Be good! Sweetness. I'm happy that you'll be joining us, bubby. Well, it's a good thing I can get that sight then, because I have no Agile, and no combat skills. Strong Like Bull, but completely inept when it comes to landing any blows. Hopefully I can talk my way out of any sticky situations, and you'll never catch me going into a combat zone. I do have a question about pics. Are there restrictions? I don't use anime, but I do tend to prefer non-model type pics. Aside from the standard E-policy on pictures? Not that I can remember. I don't see your bio in the char thread Josi, so no. But going off the others that are there, looks like what I usually tend to roll with will work. 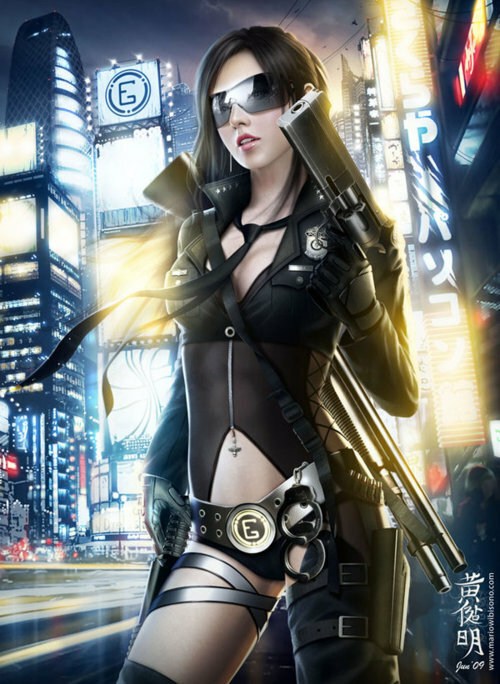 There's also a thread here that has some shadowrun-esque pictures if you'd like to look through them... and if anyone finds anymore that you think might make good shadowrun pictures, please post them there. bubby, you should be fine. It can be tough to find live action images of elves, orks and trolls that aren't medieval style. I'm finding a lot of images on Deviantart, a lot of good ones. Ooooh Lunar and Corvus! I found a reference to a seattle sourcebook, as well as a Berlin sourcebook, which will help me more with my characters backstory, than this game. Are you using the Seattle sourcebook, by any chance? I only ask, because I want to know if it's as awesome as it sounds. Link them in the Shadowrun image thread so others may enjoy them and maybe find a face for their character. We're using the Corebook, or Player's Handbook which is based on Seattle. Can you be more specific as to which books and what information from those books? It was announced in May of last year, that the newest Shadowrunner Sourcebook will be based on Berlin. Here's an article about it, although it's not very in depth. Here. Well, we're not using any other sourcebooks for gear, equipment, cyber, magic, etc... but if you're just looking to draw some background information from it for your character who's from Berlin or surrounding areas, I don't see a problem with that. If Lunar signs off on it, you've got the green light with me. We'll check what you have in your character sheet when you submit it and if there's a problem with it, we'll let you know. Yeah, I'm basically using the German sourcebook for just background, info that may help with the cultural aspect of my Hanna. I won't be using anything else from it, so no worries with that. As for the Berlin sourcebook, I can't wait until it comes out! I want to get my greedy little hands on it, and soak it up. Hanna and Her partner are from Berlin, so hopefully more cultural background will come from it. I'm hoping it'll have more info on the Russian aspect of Berlin, as well as it's seedy underbelly. Lunar quote: "Seattle sourcebook is mainly for mob bosses and stuff like that. We're not using those we have our own custom ones. We're not using a lot of those NPCs rather. So in short the only book you should be using for character creation is the main book. You can use some of the Seattle Sourcebook locations for a better layout of the city (but not everyone has access to that), for your backstory only. We are not using other books because not everyone can get them or use them. We are sticking strictly to the Main Corebook for the most part."